Musings of an Artist's Wife: Dance with Me, George! 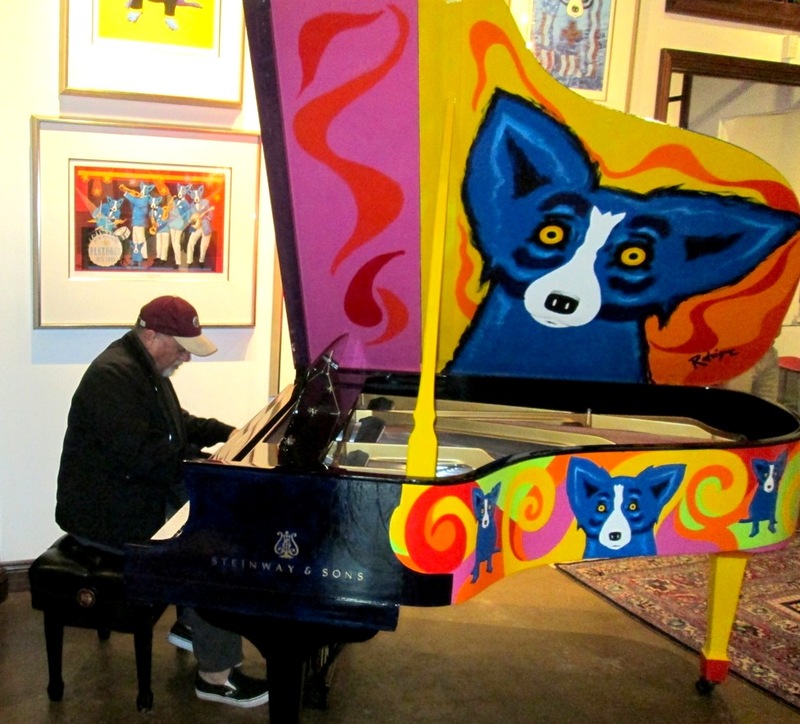 ….asked George Jones of George Rodrigue at a Lafayette, Louisiana Mercedes dealership, as Jones shopped a new car and Rodrigue awaited repairs on his 1978 diesel station wagon. “I’m an artist,” he replied. Rodrigue recalls the country music legend on that day in 1983 as “a small, slightly built man with slicked-back hair and wearing a baby-blue jumpsuit." The Arts cross over from music to dance, acting, and performance of all kinds. In our house, the focus lies on the visual arts and writing; but all are forms of personal expression. 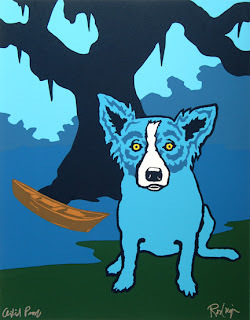 If one's lucky, one retains a voice like Jones or a style like Rodrigue, both distinctive and recognizable as theirs alone, something inseparable from not only their lives, but also their legacies. In the painting above, Lennis Romero of the famous St. Martinville Romero Brothers, who performed for years beneath the Evangeline Oak, plays his accordion alongside Max Gregg, a Cajun storyteller and historian who ran a small Acadian Museum in the town. 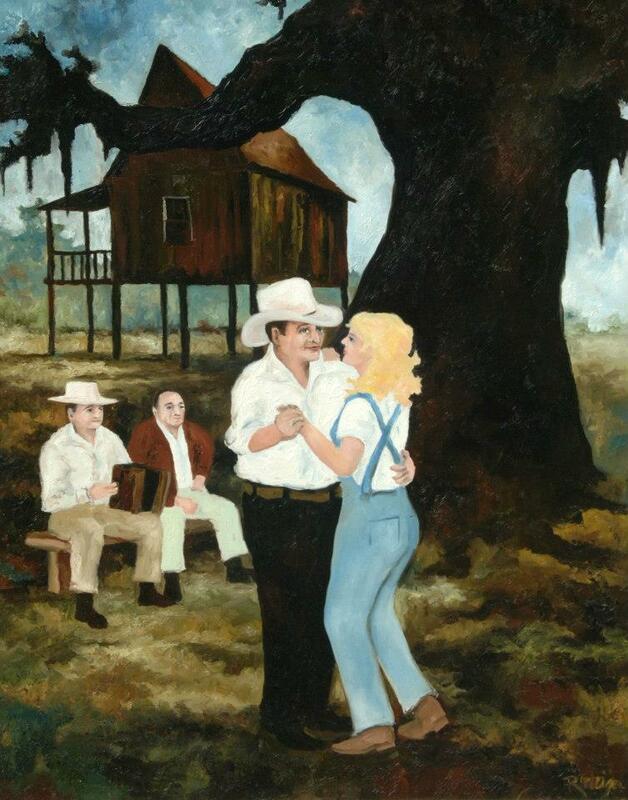 A Port Arthur Texan, Jack Rains, dances with his Jolie Blonde at a Cajun fais do-do. On this one canvas, the Arts integrate in paint, music, dance, storytelling, legend and style, brought together by George Rodrigue’s imagination and the unfettered Cajun culture. The title, Dance with Me Henry, comes from the song, also called Roll with Me Henry, made famous by Etta James in 1955. “Dance with Me Henry is one of the first Rock & Roll songs I bought as a teenager,” recalls Rodrigue. “My cousin Charmaine worked at the music store in New Iberia and picked out five 78-rpm records, including another favorite, Hearts Made of Stone by the Fontane Sisters. 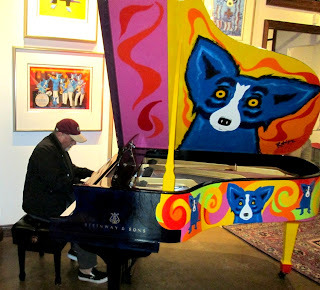 Last weekend during the New Orleans Jazz and Heritage Festival, the Arts blended easily when Billy Joel, pictured below, stopped in the George Rodrigue Foundation of the Arts (GRFA) to play the Rodrigue Steinway, a 1913 piano donated and restored by Hall Piano Company and Steinway & Sons, and painted over three months last year by George Rodrigue. Sponsored by and benefiting the LSU School of Music, this magnificent instrument mixes the musical and visual arts, reinforcing an important GRFA mission: arts integration in education through Louisiana A+ Schools. “I swirled music in paint along the sides,” explains George. Also recently, as we twirled in George's Carmel studio to Stevie Wonder, thanks to our tech-savvy son Jacques and the Pandora radio now piped throughout our house, George recalled another story from his youth, one that sent me running for my pen. “I was too young to drive, but I could dance,” he explained, describing a party and dance contest for the boys at New Iberia’s Catholic High and the girls at Mount Carmel. Cheryl was great, I interjected, but she never struck me as an ‘I’ve got rhythm’ kinda gal. George!, I exclaimed, imagining his conservative, aging parents, who so often seem disconnected in George’s memories from their only child and his art. They were there the whole time?! "...sent me running for my pen." And all the personal expression comes full circle. Yes, it's George's story, but it's in ink from your pen. My sister helped me pick out last week my first REAL pen, as in my first pen not from Target or the grocery. It's fat, smooth and shiny, in neon yellow with a turquoise case. I'm in heaven, and I'm contemplating an insurance rider. I'm going to have to share this. As usual, I clicked on all the links, mesmerized by the stories, told as only you can. Loved the one about Etta James. So now I go to sleep dreaming about dancing under the Evangeline Oak, putting my Jolie Blonde self in the picture with my man. Beautiful just like the story most interesting too. Wendy, I just received a link to this newsletter. I obviously had missed it before. It brought back a flood of memories. I miss you and George of course. Call when you are coming through.